With Thanksgiving just six days away, I thought I would search for any articles in GenealogyBank’s archives that mentioned Dr. Samuel Fuller—who was one of my Mayflower ancestors. I searched putting the terms “Mayflower Samuel Fuller” in the “Include Keywords” search box. Bang—GenealogyBank returned over 1,800 records. That’s great; I can spend a long Thanksgiving weekend documenting more ancestors in our family tree. Looking at the search results in GenealogyBank’s online newspaper archives, I can quickly see that the articles are exactly what I was hoping to find so that I can dig deeper into my Mayflower roots. 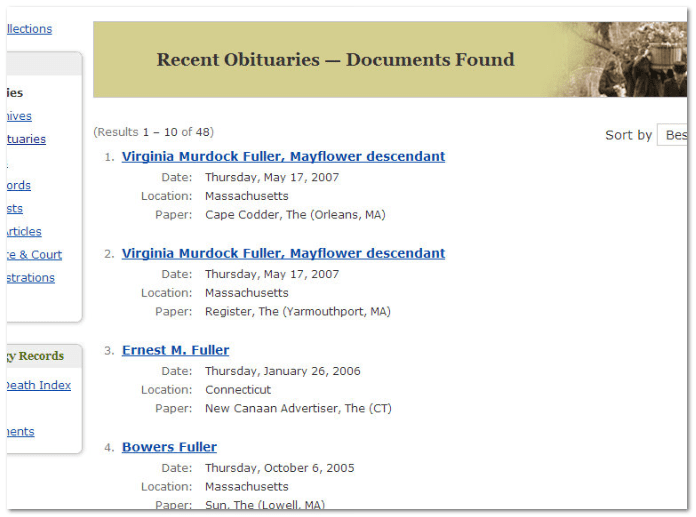 Looking at some of the article snippet views I see an obituary notice of Mrs. Harriet M. Clapp, a Fuller descendant; an article about the Mayflower signers; an article from a genealogy column that appeared in the Plain Dealer (Cleveland, Ohio); and an article about the cradle used by Dr. Samuel Fuller’s children. These are clearly some solid articles I can use for my Mayflower genealogy research. I will want to take the time to sift through and study each one, noting and following each clue to trace my Mayflower ancestry. 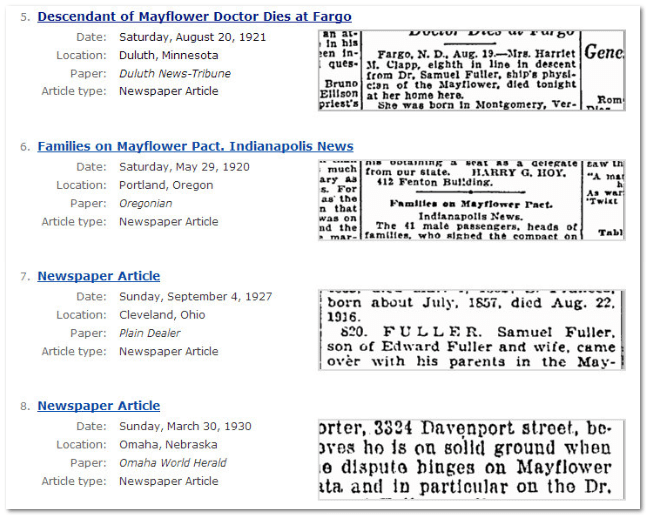 Looking at my initial overview of the Mayflower search results, they also include 48 obituaries from our Recent Obituaries collection. After clicking on those results, I see that these 48 hits are also going to be useful in helping me learn more about my Mayflower ancestors. It is common for individuals to be enthusiastic about their family history—so much so that they often refer to it even in their obituary. Great. This gives me even more articles to read through and add more relatives to my family tree. I expect that researching my Mayflower lines using this wide approach will net me over 1,000 very useful and targeted articles, letting me add hundreds of new relatives to my family tree. It’s going to be a busy Thanksgiving! From old passenger lists to recent obituaries, you can find records to discover more about your early American roots in GenealogyBank’s online archives.